The Foundation is a great place for students at Western and other area colleges to gather during the week for Bible study, fellowship, worship, and food/meals. If you’re tired of going to the same dining hall every Sunday night and eating the same things over and over again, then you need to swing by the Wesley Foundation at 6:00pm for a really, really good meal! Here at the Wesley Foundation, we believe it is our sacred duty to provide you with a good meal at least once a week! OK…it might not really be a “sacred duty” but we think it’s still pretty important! And the best part of it all is that it’s 100% FREE! It’s pretty difficult to keep a connection to your faith in college. There are so many other options, choices, temptations and sometimes, there is just so little TIME! If you want to stay connected to your faith while on campus then we want to see you here at the Wesley Foundation on Wednesday nights for worship. Wednesday Worship is a place for you to come and be filled with the Spirit and leave refreshed and renewed for service in His name. You can sing His praise, honor Him in prayer, connect with other believers, and grow in your relationship with Christ. This is where you need to be if you’re going to thrive as a Christian in college! Retreat. Water Balloon Fights. Game Days. Mission trips. Visit the website or come on Sunday nights (meal) or Wednesday nights (worship) to find out more - and share your ideas! 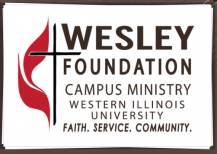 Mark Hendrickson is the new director at the Wesley Foundation (beginning Fall 2014). This will be a big plus for the Wesley Foundation. At WIU Wesley we make it a point to serve and give back to our community. Whether it is an after school program in Good Hope or manning and restocking shelves at a local food bank, we seek to serve our community as Christ served us. There will be a number of opportunities to serve others and show them Christ’s love throughout the school year. Christian Faith Campus Ministry is a predominantly African-American, nondenominational ministry. It is a recognized student organization of Western Illinois University.